What they do all day? In many ways, a physician assistant's day looks a lot like a doctor's. They perform physical exams, make diagnoses, write prescriptions and interpret lab results. They can also choose a medical specialty, such as pediatrics, orthopedic surgery, even psychiatry. The big difference is that a PA has less education and works under the supervision of a physician. How to get the job? Candidates generally need a master's degree from a physician assistant program, which is similar to medical school but takes just two to three years. Ideally, PAs will also have some previous health care experience. What makes it great? 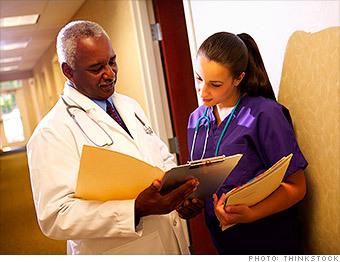 It's a quicker path into the field than an M.D., and the pay is still attractive. As waits to see primary care doctors get longer, PAs can help make health care more accessible to more people. What's the catch? Many patients aren't familiar with the title, so physician assistants have to repeatedly explain the job. Some state laws place rigid restrictions on PAs; the industry is working to change that. --K.A. Do Physician Assistants have great jobs, or what?